FR481 allows simultaneous detection and enumeration of kappa and lambda light chain bearing cells. For in vitro diagnostic use. results must be made within the context of the patient’s clinical history and other diagnostic tests by a certified professional. 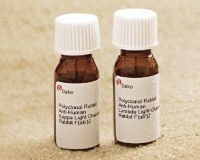 Polyclonal Rabbit Anti-Human Kappa Light Chains conjugated with fluorescein isothiocyanate isomer 1 (FITC). Polyclonal Rabbit Anti-Human Lambda Light Chains, conjugated with R-phycoerythrin (RPE). The two conjugates in FR481, Anti-Kappa Light Chains and Anti-Lambda Light Chains conjugate have been produced from F(ab')2 fragments of affinity-isolated polyclonal rabbit antibodies. FR481 is provided in liquid form in buffer containing 1% bovine serum albumin (BSA) and 15 mmol/L NaN3, pH 7.2. Each vial contains 50 tests (10 L of conjugate for up to 106 leucocytes from normal human peripheral blood). Rabbit Anti-Human Kappa Light Chains: Polyclonal immunoglobulin light chains of kappa type isolated from a pool of human sera. Rabbit Anti-Human Lambda Light Chains: Polyclonal immunoglobulin light chains of lambda type isolated from a pool of human sera. Anti-Kappa Light Chains reacts with free kappa chains as well as kappa chains in intact immunoglobulin molecules. The specificity has been ascertained as described below. To obtain maximum sensitivity, the crossed immunoelectrophoresis specificity test was performed prior to affinity purification and pepsin degradation. Crossed immunoelectrophoresis: Only kappa-related precipitates appear when the antibody is run against human plasma. Staining: Coomassie Brilliant Blue. a specific staining of a part of the CD19-positive B lymphocytes is seen corresponding to the expected range of kappa light chain expression. below. To obtain maximum sensitivity, the crossed immunoelectrophoresis specificity test was performed prior to affinity purification and pepsin degradation. Crossed immunoelectrophoresis: Only lambda-related precipitates appear when the antibody is run against human plasma. Staining: Coomassie Brilliant Blue. blood, a specific staining of a part of the CD19-positive B lymphocytes is seen corresponding to the expected range of lambda light chain expression. Flow cytometry: When FR481 is applied as described in the staining procedure, on lysed human whole blood, a specific staining of a part of the lymphocytes is seen, within the expected range of kappa and lambda light chains expression. Flow cytometric analysis of single suspensions from formalin-fixed, paraffin-embedded tissue samples demonstrated that Anti-Lambda Light Chains labels reactive hyperplastic lymph nodes (10/10 cases), and so does Anti-Kappa Light Chains (10/10 cases). In non-Hodgkin’s lymphomas, the antibody labeled 5/10 cases. The remaining cases were positive for kappa light chains (4/10 cases) or showed no expression of light chains (1/10 cases) (4). Flow cytometric analysis of peripheral blood lymphocytes demonstrated that Anti-Kappa Light Chains and Anti-Lambda Light Chains, respectively, label a proportion of B-cell chronic lymphocytic leukaemias. Thus, in one study of 121 cases (2), 37 were positive for kappa and 17 were positive for lambda. In another study of 165 cases (3), 97 were positive for kappa and 68 were positive for lambda. lead and copper plumbing to form highly explosive build-ups of metal azides. Upon disposal, flush with large volumes of water to prevent metal azide build-up in plumbing. 3. As with any product derived from biological sources, proper handling procedures should be used. Наименование: MultiMix, Rb a Hu Kappa Light Chains/FITC + Lambda Light Chains/RPE / Kappa/Lambda FITC/RPE. дополнительная информация (на английском языке).